In time for Women's History Month, here's a celebration of some of the best science fiction being written by women today. This bundle gathers a wide range of outlooks and possibilities, including an anthology that gives you a smorgasbord of other authors you may enjoy. I used to work in the tech industry, and there I saw how diversity could enhance a team and expand its skillset. Women understand that marketing to women is something other than coming up with a lady-version of a potato chip designed not to crunch or a pink pen sized for our dainty hands. Diversity means more perspectives, and this applies to science fiction as well. I am more pleased with this bundle than any I've curated so far. In her feminist literary theory classic How to Suppress Women's Writing, science fiction author Joanna Russ talked about the forces working against the works of women (and minority) writers. A counter to that is making a point of reading and celebrating such work, and for me this bundle is part of that personal effort, introducing you to some of my favorites. 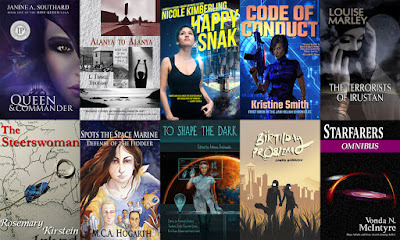 And in the name of expanding one's knowledge and enjoyment of women writing SF, the majority of these books are first volumes of series, and I hope if you enjoy them, you'll find the others as well as telling other people about them. The Kirstein series is the only one where not all the books are available; she's currently working on book five and plans seven altogether. Many of them are independently or small press published, showing the depth and quality of work such publishing venues can yield. I come to the task of writing these notes having just finished reading through a slush pile for an anthology I'm editing, If This Goes On, devoted to political science fiction. Some of the themes there are echoed in some of the works here, and it's been interesting to note the resonances. Other books in the bundle are more lighthearted or escapist. I hope everyone will find at least a few they enjoy, and that many readers will join me in thinking they're all swell.